Reset oil service light Toyota Tacoma second generation. From year: 2004, 2005, 2006, 2007, 2008, 2009, 2010, 2011, 2012, 2013, 2014. How to reset maint reqd service light Toyota Tacoma 2 generation. Engine Oil Replacement Reminder Light (for vehicles sold in U.S.A.). This light acts as a reminder to replace the engine oil. This light will come on when the ignition key is turned to “ON” and will go off after about a few seconds. When you drive for about 7200 km (4500 miles) after the engine oil replacement, this light illuminates for about 3 seconds and then flashes for about 12 seconds with the ignition key turned to the “ON” position. If you continue driving without replacing the engine oil, and if the distance driven exceeds 8000 km (5000 miles), the light will come on after the ignition key is turned to “ON” position. The light will remain on thereafter. Turn the ignition key to the “OFF” position with the odometer reading shown. For details, see “Odometer and two trip meters” in this category. 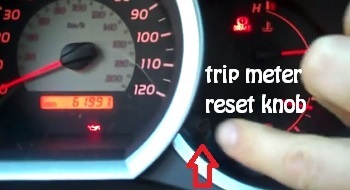 Turn the ignition key to the “ON” position while holding down the trip meter reset knob. See below picture. Hold down the knob for at least 5 seconds. The odometer indicates “000000” and the light goes off. All information how can you reset oil service light is taken from Toyota Tacoma second generation owners manual. That it is the full procedure how to reset oil service light Toyota Tacoma second generation. If you like to reset any maintenance oil light after an oil change. Or reset check engine light, airbag light, inspection key or insp errors when maint reqd, for Toyota cars. Or any warning light for service reminder which appears on the display. Write in the search box the car name for which you want to find information, and find how to reset other service reminders by yourself. This entry was posted in Service light reset Toyota and tagged ignition, key, light, maintenance oil light, odometer reading, oil, oil service, Reset oil service, service light, service reminder, Tacoma, the engine oil on February 16, 2014 by reset service. 2. Press and HOLD the trip-odometer button “0.0”. 3. Turn your key to run (one position before starting engine). 4. Release the trip-odometer button. 5. Push and release the Clock Minute Set Button “min”. 2. Use the rocker switch on the windshield wiper lever to select “Settings” and confirm with button underneath windshield wiper lever then follow steps 4-5. 4. Select the “Settings” menu followed by the “Service” submenu. Select “Reset” and confirm. *vehicles equipped with a navigation system can also access the reset menu from the SETTINGS button. This entry was posted in Service light reset Volkswagen and tagged ignition, indicator, oil service, position, run, service light, service light indicator, steering wheel, Tiguan on February 15, 2014 by reset service. 2. Press and hold the 0,0 button (located to the right of the instrument cluster). 3. Turn the igntion on (do not start the engine) and release the 0,0 button. Briefly press the double square button (located to the left of the instrument cluster). This entry was posted in Service light reset Volkswagen and tagged ignition, indicator, light, light indicator, oil service, right, service light indicator, steering wheel, vehicles on February 15, 2014 by reset service. 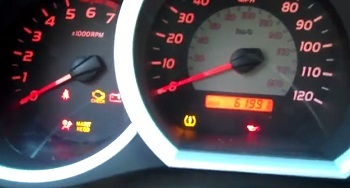 Reset tire pressure warning light Toyota Rav4 XA40 fourth generation. From year: 2013, 2014. How to reset oil service light Toyota Rav4, 3 generation XA30, 4 generation. How to initialize the tire pressure warning system. Park the vehicle in a safe place and turn the engine switch to the “LOCK” position (vehicles without a smart key system) or off (vehicles with a smart key system). Initialization cannot be performed while the vehicle is moving. Adjust the tire inflation pressure to the specified cold tire inflation pressure level. Make sure to adjust the tire pressure to the specified cold tire inflation pressure level. The tire pressure warning system will operate based on this pressure level. Turn the engine switch to the “ON” position (vehicles without a smart key system) or IGNITION ON mode (vehicles with a smart key system). Vehicles without a smart key system: Wait for a few minutes with the engine switch in the “ON” position and then turn the engine switch to the “ACC” or “LOCK” position. Vehicles with a smart key system: Wait for a few minutes with the engine switch in IGNITION ON mode and then turn the engine switch off. Registering ID codes Toyota Rav 4. The tire pressure warning valve and transmitter is equipped with a unique ID code. When replacing a tire pressure warning valve and transmitter, it is necessary to register the ID code. Have the ID code registered by your Toyota dealer. You have tire damage such as cuts, splits, cracks deep enough to expose the fabric, and bulges indicating internal damage. A tire goes flat repeatedly or cannot be properly repaired due to the size or location of a cut or other damage. Replacing tires and wheels (vehicles with the tire pressure warning system). Any tire over 6 years old must be checked by a qualified technician even if it has seldom or never been used or damage is not obvious. Routine tire inflation pressure checks (vehicles with the tire pressure warning system). Situations in which the tire pressure warning system may not operate properly (if equipped). In the following cases, the tire pressure warning system may not operate properly. If non-genuine Toyota wheels are used. A tire has been replaced with a tire that is not an OE (Original Equipment) tire. A tire has been replaced with a tire that is not of the specified size. Tire chains etc. are equipped. An auxiliary-supported run-flat tire is equipped. If a window tint that affects the radio wave signals is installed. If there is a lot of snow or ice on the vehicle, particularly around the wheels or wheel housings. If the tire inflation pressure is extremely higher than the specified level. If the spare tire is in a location subject to poor radio wave signal reception. Performance may be affected in the following situations. Near a TV tower, electric power plant, gas station, radio station, large display, airport or other facility that generates strong radio waves or electrical noise. When carrying a portable radio, cellular phone, cordless phone or other wireless communication device. When the vehicle is parked, the time taken for the warning to start or go off could be extended. When tire inflation pressure declines rapidly for example when a tire has burst, the warning may not function. This entry was posted in Service light reset Toyota and tagged key system, level, oil, oil service, phone, signal, Toyota Rav, vehicles, warning, warning light on November 16, 2013 by reset service.